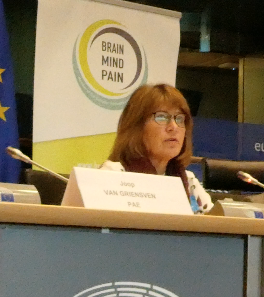 This meeting was hosted by Lieve Wierinck MEP who welcomed attendees on behalf of the MEP Interest Group on Brain, Mind and Pain in partnership with the European Academy of Neurology and the European Pain Federation. She introduced the session by saying the right to health is a basic social right enshrined in The EU’s Charter of Fundamental Rights of the European Union ‘’everyone has the right of access to preventive healthcare and the right to benefit from medical treatment’’ yet it is still not a reality for all of us. Large health inequalities persist in the EU and many patients do not have access to effective treatment for neurological and pain disorders. Uncontrolled symptoms worsen the personal and economic impact of these disorders, new and better treatments are urgently needed. The first speaker was Professor Guenther Deuschl, President of the European Academy of Neurology (EAN) who spoke about EAN’s role and purpose. 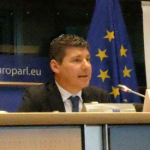 Professor Bart Morlion, President of the European Pain Federation (EFIC) was the second speaker. EFIC is made up of chapters of the International Association for the Study of Pain (IASP) with increasing numbers of top doctors specialising in pain management. EFIC healthcare professionals look after over 740 million people in 37 member countries. With a strong focus on ‘education’ EFIC is moving towards greater patient involvement and improved access to treatments. 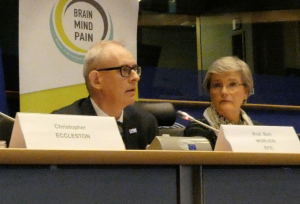 During The European Year against Pain, EFIC had partnered with Pain Alliance Europe to advocate for better access and tackle healthcare inequalities. A key outcome had been establishing an expert group on the Social Impact of Pain (SIP). Fifty participants from all across Europe were reviewing recommendations made in 2017 and aligning objectives for 2018. STROKE: Professor Franz Fazekas summarised the results of a survey by the European Stroke Organisation highlighting stroke as the most common cause of death in Europe with extensive variation according to country. Drawing on the outcomes of an EAN study, the main pillars of treatment to save lives had been the introduction of stroke units across Europe – now numbering 200 – and intravenous treatment for thrombosis. There were significant differences in care standards pan Europe leading to excessive mortality and lost quality of life. Europe- wide political lobbying is needed for more research and equitable treatments. Professional medical societies can help by producing and sharing guidelines. PARKINSON’S DISEASE: Professor Guenther Deuschl explained the estimated 1.25 million cases across Europe with 303,000 new diagnoses every year. Treatment options are available or under development but not all equally accessible for patients. The EAN Value of Treatment project was addressing this by using case studies to identify treatment and patient journey gaps with economic analysis and recommended solutions. Major issues were late diagnosis, access to medication, including advanced treatments e.g. deep brain stimulation, access to specialist care, need for more research and data on numbers of specialist neurologists and their training. CHRONIC PAIN: Professor Christopher Eccleston directs the centre for pain research at the University of Bath, home to pain and rehabilitation scientists active in the fields of evidence-based pain, e-health, therapy innovation, adolescent and family pain, and individual differences. He reflected on his book ‘European Pain Management’, the first comprehensive publication on the state of pain care and access to treatment across Europe. Professor Bart Morlion then spoke about EFIC’s activities and how they help to improve equitable access to high-quality treatment for patients in Europe. Chaired by Nicola Bedlington, Director, European Patients’ Forum (EPF). In her opening remarks Nicola highlighted that chronic pain in all disease areas is debilitating from social, economic and medical perspectives and more research and development is needed. Nicola introduced the vision, work and structure of EPF now representing 74 umbrella organisations and national patient coalitions. EPF is working with member organisations towards universal achievement of Sustainable Development Goals by 2030. It has set up a Patient Access Group to monitor each county’s progress against the Goals. A multi-stakeholder approach to integration at national level with county specific objectives is promoted. 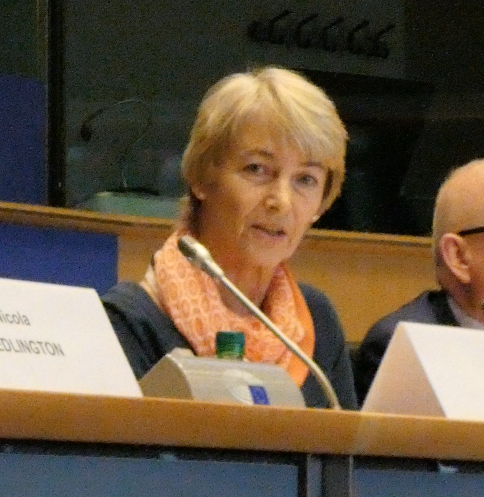 Monika Benson, Dystonia Europe explained that dystonia is a neurological disorder and medical term for a range of movement disorders causing muscle spasms and contractions. An estimated half a million people live with dystonia. There is no cure but it can be effectively managed usually by injecting into affected muscles every three months. As long as patients are regularly treated, their quality of life, including employability, is mostly good. Issues for patients are: inequitable access to treatments – not every country has approved injections; cuts in healthcare costs – in some countries patients pay for treatments themselves with long-term affordability problems; treatment regimes in some countries are prolonged e.g. injections every four months instead of three. Other problems are the waiting times for referrals to a neurologist and late or missed diagnosis. Solutions would include involving more patient advocates in awareness raising and better education for general practitioners to inform earlier diagnosis. Neil Betteridge, Rheumatic and Musculoskeletal Diseases developed juvenile arthritis when only 4 years old and became a patient advocate sixteen years ago. His personal mission has been to promote the need for medical professionals to become more patient focused. There are over 200 known variants of rheumatic and musculoskeletal diseases ranging from gout to rheumatoid arthritis. There are ongoing equity issues in ensuring access to treatments for all. More advocacy associations were needed to ensure the patient voice and funding for more scientific and social research and more health professionals – clinicians, physiotherapists, psychologists etc. Astri Arnesen, Huntington’s disease explained that Huntington’s is a rare neurodegenerative disease with complex symptoms – motor movements, psychiatric and cognitive. Incidence is 7-12 cases per 100,000 people. Often hereditary with a 50% chance of diagnosis if a parent has had it too, the first onset of Huntington’s can be at any age from juvenile to people in their seventies. There is no known cure but helpful treatments are available advised by multidisciplinary teams depending on disease progression at different stages of life. Inequity of access to treatment is a common problem in Europe with the need for greater awareness and more patient associations. The disease brings social stigma and loss of self- esteem with families ashamed that their inherited genes are often the cause. The situation for Huntington Disease patients in some European countries is improving thanks to the work of the European Reference Network. Digital and telemedicine developments are helping but a strategic, structured approach to campaigning for change is essential. Political will and cost efficiency are key with national funding to make a real difference. The Norwegian Government has pledged one million euros pa which has been a good start in helping to raise awareness. Joop van Griensven, Chronic Pain emphasised the need for high quality treatment dependent on the length of time taken to diagnose a condition and how long a patient has suffered from chronic pain. Wait times for diagnosis and treatment are common issues in Europe and treatments are not matching expectations with only 40% of patients expressing satisfaction in a recent survey. There is an outstanding issue of defining and benchmarking a quality care standard for chronic pain. 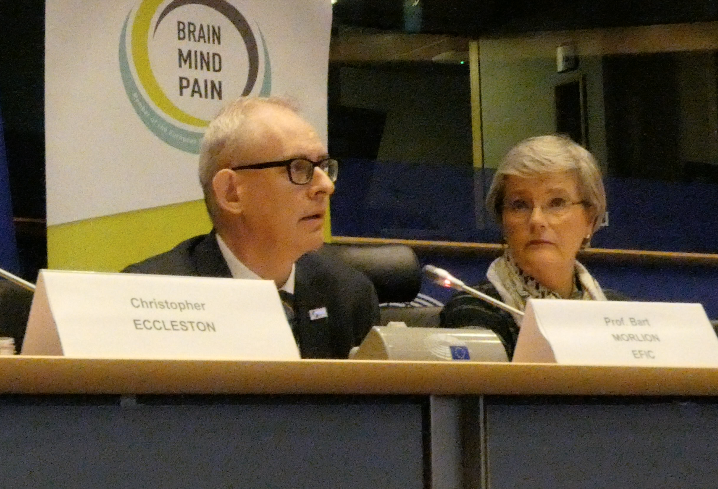 Meeting attendees were invited to participate in an on line chronic pain survey on the website until 4 December 2017 and to consider volunteering to join the Brain, Pain and Mind’s Expert Patient Group. THE FUTURE- Will Brexit derail progress? Elisabetta Zanon of the Brexit Health Alliance said that health had been at the centre of the Brexit debate with an extra £350 million per week promised for the NHS by the Leave campaigners. 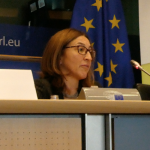 She reminded the audience that cooperation across Europe has resulted in many benefits for patients including reciprocal healthcare; the safety of pharmaceutical and medical devices, blood and organs are regulated by EU. Many people know that across the EU there was a reciprocal healthcare system for holidaymakers and pensioners. But in future patients could be denied access to best specialised treatment, face cost of private health insurance or have to pay personally for treatment received abroad. A big concern is that relocation of the European Medicines Agency (EMA) may cause disruption and capacity issues. And future trade barriers and diverging regulatory systems could lead to delays for patients in accessing innovative therapies, some medicines or devices becoming unavailable in some countries plus possible higher costs. 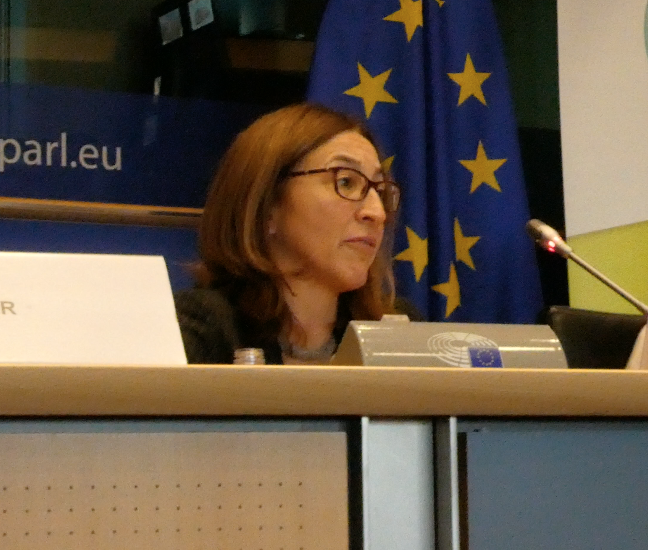 Elisabetta Zanon reminded us that the UK was a leading partner in EU Joint Programme in Neurodegenerative Disease Research and has highest number of pan-European trials for both rare and childhood diseases. She said that policy makers and patient orgnisations should press for health issues to be prioritised in the negotiations. 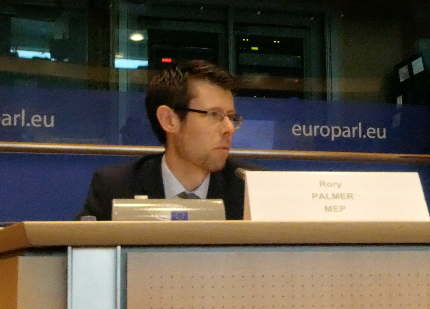 Rory Palmer MEP became an MEP in October 2017 after serving for six years as the first deputy city mayor in Leicester. He has always put health and social care at the heart of his public life. He emphasised the impact Brexit could have on citizens who rely on reciprocal EU healthcare arrangements. Disabled people, the retired and people with multiple conditions could face particular challenges. He stressed the importance of working together to ensure that co-operation continues. Around 10,000 EU nationals have quit the British NHS since the Brexit referendum, according to the agency that collects data on the health service. Rory called on the UK government to ensure an immigration system that is straightforward and welcoming to health workers and researchers at all levels and their families too. He said that patients must mobilise for health to be prioritised. As an MEP he will continue to work to secure the best possible outcome for patients, researchers, healthcare workers and citizens across Europe. Ann Little, President, European Association of Neurological Associations closed the meeting by thanking all speakers, attendees and organisers, with special thanks to Lieve Wierinck for hosting it. 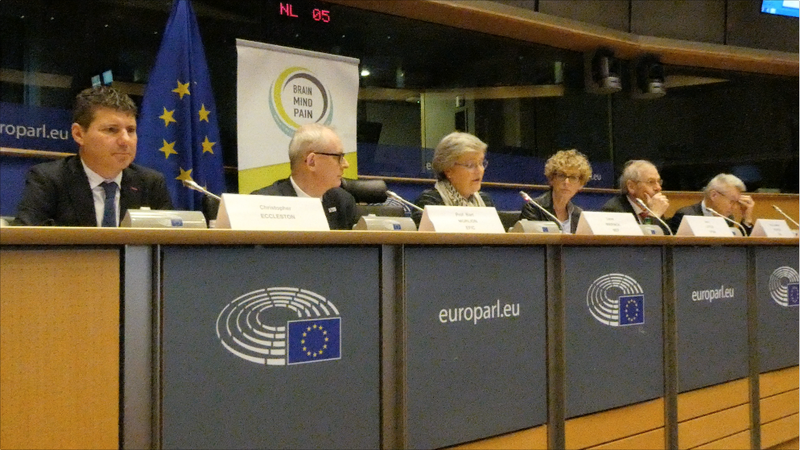 This meeting was an initiative of the European Federation of Neurological Associations [EFNA] and Pain Alliance Europe [PAE], co-chairs MEPs Marian Harkin, Jeroen Lenaers and Daciana Sârbu. Our aim is to encourage research into and access to innovative treatments, promote prevention and self-management approaches, decrease stigma and work together to improve quality of life for people living with these disabling conditions.